As some collectors likely noticed, a few 2014 Bowman Draft Picks & Prospects autographs made their way into 2015 Bowman Chrome Baseball. Michael Conforto of the New York Mets and Ronnie Williams of the St. Louis Cardinals are the only two instances. 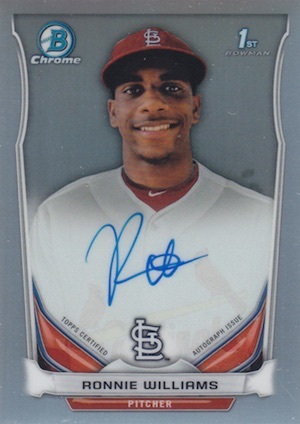 Instead of destroying the cards, Topps elected to include the two young prospects in 2015 Bowman Chrome. Topps has confirmed that this is the only place where these two cards will be found. The cards were not ready in time for inclusion in 2014 Bowman Draft Picks & Prospects and that is how they ended up in this release. Although Ronnie Williams is not a household name, Michael Conforto is already touted as one of the top young prospects for a surging Mets squad. 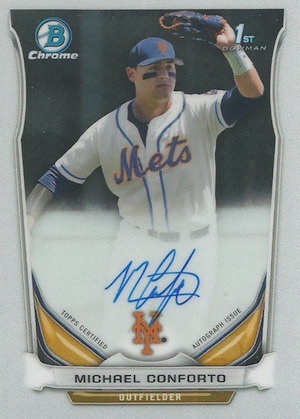 This card is particularly noteworthy for collectors because it is Conforto's first Bowman Chrome autograph. Both players were included on the final Chrome Prospect Autographs checklist in 2015 Bowman Chrome, but it was not known they were from 2014 until the product was released. Full Refractor parallel options are available for each player. This is not an isolated incident as most of the card companies occasionally issue previous autographs in new sets when they were not available for the intended product. Perhaps most memorable, 2013 and 2014 Kris Bryant prospect autographs were found in several different releases. However, Topps has stated that this will not be the case for the cards for Conforto and Williams, which are exclusive to 2015 Bowman Chrome. 2x 2015 Bowman Chrome HOBBY Pack(Kris Bryant Torres Bellinger Conforto RC AUTO)? 2015 Bowman Chrome HOBBY Pack (Kris Bryant Ozzie Albies RC Conforto Auto)? 2x 2015 Bowman Chrome HOBBY Pack (Kris Bryant RC Cody Bellinger Conforto AUTO)? 2015 Bowman Chrome Factory Sealed Baseball Hobby Box Kris Bryant AUTO RC ? ?